Watch the creative process unfold when more than 60 artists wielding their paint brushes descend upon Fort Myers Beach for the 8th Annual Paint the Beach festival on Nov. 7-12, 2017. 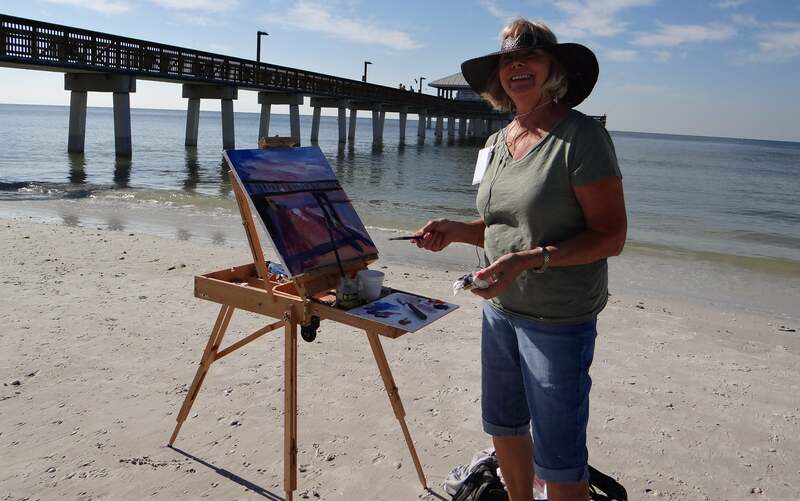 Artists paint the inspiring Fort Myers Beach area during the annual Paint the Beach festival. 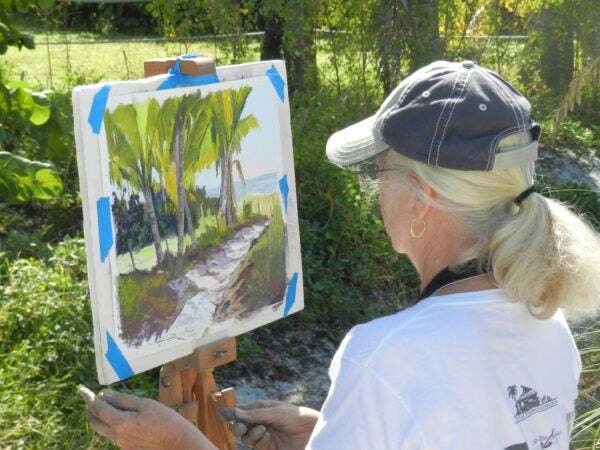 Artists come from across the country for this plein air event. 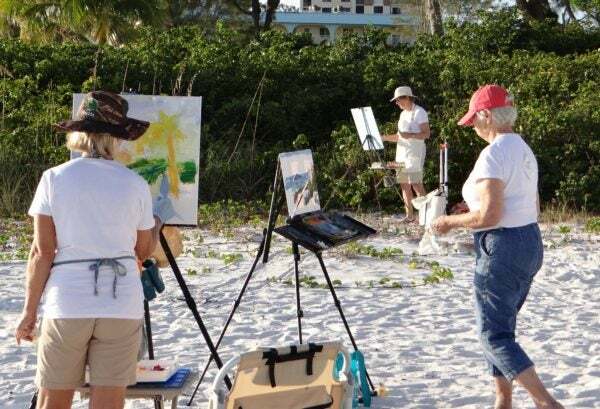 They set up their easels on Nov. 7 to 9 from Main Street to Lovers Key State Park and draw inspiration from the turquoise Gulf waters, sandy white beaches, colorful shorebirds, lush greenery, and cute cottages and other architecturally-interesting buildings that dot the area. Some pieces feature boats gently bobbing on the water. Others highlight sea grasses waving lightly in the breeze. Kayakers gliding by also make appealing subject matter. Everyone is invited to watch as blank canvases become masterpieces, capturing the images and feel that make Fort Myers Beach such a relaxing, scenic and enjoyable place. On Wednesday, Nov. 8 there will be a special “Sundowner” painting event in front of Junkanoo as the sun is setting. Artists start at 4 p.m. and end at 6 p.m. with a gathering at the Fort Myers Beach Art Association (3030 Shell Mound) across the street immediately afterward. Meet the artists and see the art all in one place. The event is free. Then, join the artists at the Collectors Preview and Awards Reception on Friday, Nov. 10 from 5 to 8 p.m. under the festival tent at Santini Marina Plaza, 7205 Estero Blvd. All of the art will be on display for the first time, and more than $6,000 in prizes will be awarded. The tickets are $10 and can be purchased at the Paint the Beach website. The artwork develops quickly as guests watch the images take shape. The artwork remains up for public viewing on Saturday, Nov. 11 from 9 a.m. to 6 p.m. and Sunday, Nov. 12 from 10 a.m. to 2 p.m.
Another great opportunity to watch artists is at the Quick Draw, which will be held on Saturday, Nov. 11 at Times Square. Artists will have from 9 to 11 a.m. to create a painting. Adult and student divisions will be awarded prizes immediately after, and the art will be for sale. Approximately 30 high school art students participate in this part of the festival. The Fort Myers Beach Art Association offers exhibits, classes, workshops, painting groups, and painting tours. For more information, call 239-463-3909.